I have always been a voracious reader throughout my life, and I continue to strive towards that goal, in my disabled years. While books have gone from hardback, to paperback, to trade paperback with aplomb in my lifetime, no single change has so radically altered the landscape as much a digital publishing of the last, fifteen years. In the beginning of such a revolution, one had to rely on PDFs being read on one’s PC, as simple user guides/manuals for software and consumer electronics; today you can read whole novels, short stories, and so much more from the comfort of bed, on the go, at the beach, etc., with eBook readers. Such a change has gifted us with the freedom we have longed for, but at a pivotal cost. We have competing storefronts that promise us the best selection, best value, sharability, and so forth, yet many do not use formats that most devices can interpret. The means for many of us, we have had to choose one device and one provider for our reading materials. A glaring problem, if you have a multi-device household, with various OS’es being used and books to share back and forth. I have to announce to you, my faithful readers (yeah I know, accidental pun) that I have found a way through this mire of DRM-laden closed bookstore systems. 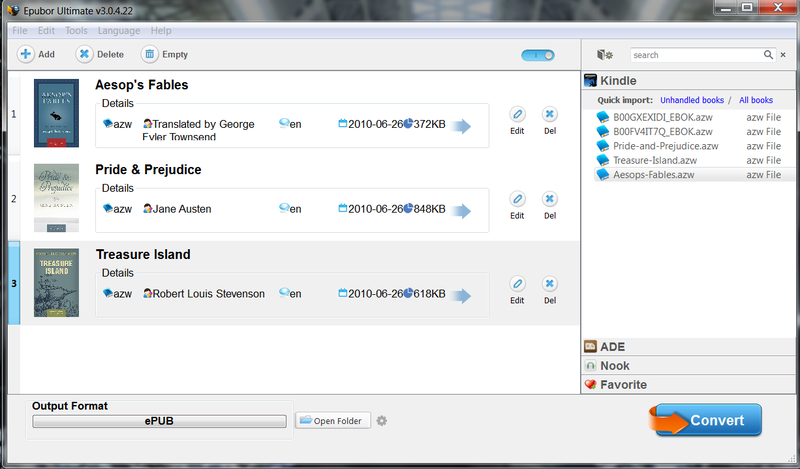 The fine folks at Epubor have developed a piece of software, called Epubor Ultimate Converter, which decrypts and transcodes DRM proprietary eBook formats into a range of open eBook formats, easily. Some pieces of software allow you to change an unprotected eBook between formats, but I have never found another software title that will remove the DRM (especially for several prominent bookseller formats). As many of you are aware of, I am disabled and rely heavily on technology to augment my way of life, and my reading is no exception. When I read, it is usually in my wheelchair, in bed, or some other seated position, away from my computer. I own an iPad (1st. Gen), while my wife owns a Nook HD, so us being able to share books that we have discovered is quite hard, as my selections come from iBooks, while she gets things from the Kindle Store or even Barnes & Noble. To complicate matters further, I have visual impairment, and as I enter fully into middle age, I find listening to audiobooks enjoyable and more pleasant that having to have the text in front of me blown up to a larger size to be read, manually. Also, I am working on other tasks, many times, so being able to hear it works well with the workflow that I find most productive. Something that I was not aware of, until recently, is that many eBooks have DRM encoding to prevent them from being read, via Text-To-Speech (TTS). This was discovered, by my wife, who also enjoys having her books read, than reading them, as she was working one day. My assumption for such protection is that this is done to preserve audiobook sales of the written editions or any unauthorized audio transcription of said book, without the author/publisher’s permission. While I fully support protecting the intellectual property of the creators, this causes serious financial and accessibility issues for the disabled. As a disabled person, with a fixed income and a spouse, I rely on getting cheap or free ebooks offered by the storefronts, daily/weekly. I have rarely seen audiobook versions available, so I get the written editions. 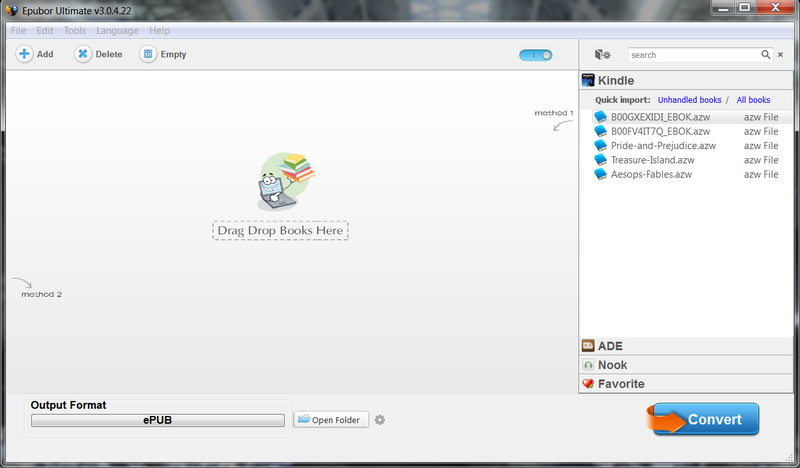 As I stated before, I tend to listen, rather than read my books, so I need to use TTS software to playback my books. The combination of these factors is why I went looking for a solution to this problem, and Epubor Ultimate Converter is delivered in spades. As I have alluded to earlier, Epubor has not only created a wonderful, powerful, full-featured software tool, but one that is very easy to use. Not unlike many Windows programs, the GUI interface is very reminiscent of a Visual Basic design, coupled with column/category split window that is easy to read/operate. 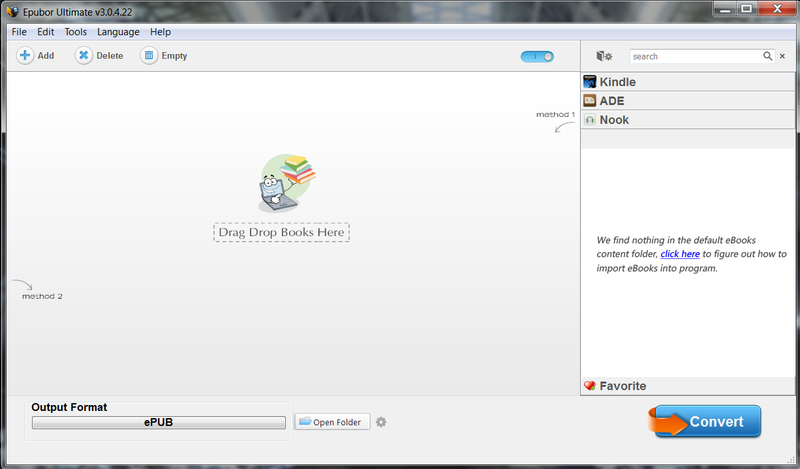 Upon startup, if you have your eBooks downloaded to your computer, you will be prompted to auto import them for conversion. This makes it very easy to change your books into the format(s) that you use, without much fuss or configuration. Once the eBooks are decrypted, you can take your eBooks and convert them to numerous formats, including Nook, Kindle, Kobe, Sony, and iBooks. For right now, Epubor supports DRM decrypting from most DRM eBook formats, with Apple iBooks being the exception. Support for that format is in the works, and hopefully will be announced in the upcoming future. I am looking forward to this feature, as I would love to be able to share my iBooks that I have acquired with my beloved wife, as well as making audiobooks for our listening pleasure. As is the norm, any piece of software has drawbacks, but Epubor Ultimate has only to document. The issue that I am referring to is the lack of iBooks DRM decryption, as they hoped a third-party provider would fill that gap. However, as I have noted, this is being addressed, by Epubor, in upcoming software updates. Knowing this is being fixed only raises my opinion of them, as a company, and their fine products. You may be asking what does such a universal eBook DRM remover and converter cost? The answer is $59.99 (one-year license), but right now you can get it for $24.99 (one-year)! If you are wary of buying a piece of software outright, they do offer a 30-day trial version, which is fully-featured for you to test out. I know that if you give this a try, you will want to purchase this program. do you still use this software with no problem? Not in the recent past, but if you need to convert book formats, I have not found a better program, especially for the money.